Take some swinging Chicago Blues, add some swampy gritty Delta Blues with a hard rock-n-roll edge, mix in some mean-and-greasy slide guitar and some wailing harmonica, and, finally, add one Risen King of Kings. The result: Crimson Blues live in concert! In the summer of 2010, drummer Bill Mallare sent a text message to guitarist, singer and all-around blues junkie Mark Jeghers. Mark was on vacation, and didn't expect to hear from anyone, let alone Bill. The text message said, "Wanna start a gospel blues band?" Mark and Bill had met playing in another blues band, a secular band that was losing steam, becoming irrelevant and drifting into the desolate no-mans-land of R&B drivel. But Mark and Bill discovered they had common ground: their Christian faith and love of blues music. Then Mark's guitar buddy Brad Marsh sat in with them while playing at an outdoor block party. Realizing there were a lot of church-going neighbors there, the three of them decided to be politically incorrect and do one of Mark's favorite slow-blues gospel songs. Right in the middle of ultra-materialistic Silicon Valley, they dared to sing a song about Jesus! It was fun, to say the least. It was a few weeks later, while Mark was on vacation watching seagulls fight over carcasses and garbage, that the text message came. What followed was a long phone call, and after that, the beginning of an adventure. Bill brought in bassman Jun Lagmay and harp player Rich Greenwood, both of whom played Christian Blues with Bill in the 90s. Mark offered first dibs to Brad Marsh to play lead guitar; Brad took about a fraction of a second to say yes. 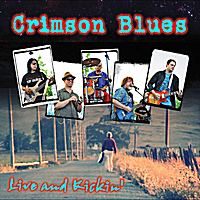 Since then, Crimson Blues has been playing high-octane Christian Blues, with all the passion and energy of rocked-up Blues, and with the message of a Risen King. Their music style spans many variations that all orbit around the universe of blues: swinging Chicago Blues, scorching hot Delta Blues, hard driving Blues-Rock, Southen Rock, and a little bit of funk for good measure. Though writing songs since age 15, frontman Mark Jeghers has not experienced such a prolific songwriting period in a long time. "Crimson has fired up creative juices in me like I haven't had in a long time", he says, "aside from the great chemistry and being surrounded by really talented musicians who make me sound better than I am alone, I think it's also just God thing." Harp player Rich Greenwood says this about playing with Crimson: "I started playing harp in 1974. I've jammed with bands from Tuscany to Times Square -- but have never been in a band like Crimson Blues before. This band is quite literally an answer to prayer for me. The perfect mix of musicians, the perfect style of music, and no matter who I share the music with, from any faith base, people always comment on the energy and drive that each song embodies. And I know it's not me, it's not the other band members, it's God shining through. This is His band ... I just get to be in it." Do you like "The Blues"??? I mean the rockin' kind of Blues that is pumped out by the likes of Stevie Ray Vaughn, The Allman Brothers Band, Glenn Kaiser and Muddy Waters? Then you'll HAVE to listen to Crimson Blues! Even if you are not familiar with Jesus or are not a "believer", you HAVE to check these guys out. Full of powerful licks, original material and something you just cannot ignore if you love this style of traditional, yet rockin' blues music. Give 'em a listen....you WON'T be disappointed. In fact, I bet you'll HAVE to have this album!